A late KO for the cup final saw us play Wootton in the twilight match of the day. In a very enjoyable and hard fought match it was Greenmount who took and early lead through a well taken Darcey goal following a great through ball from Ray. The second half was played out in a very similar pattern to the first half and again we looked strong defensively, making good tackles and with some good goal keeping from Evie. Hettie and Charlotte were supporting well making decisive tackles and passes in midfield. Isla and Darcey caused Wootton problems up front and we had a few good goal scoring opportunities which produced either good saves or saw the ball fizz just wide. But in the final minutes Darcey latched onto the loose ball to fire home. 2-1. 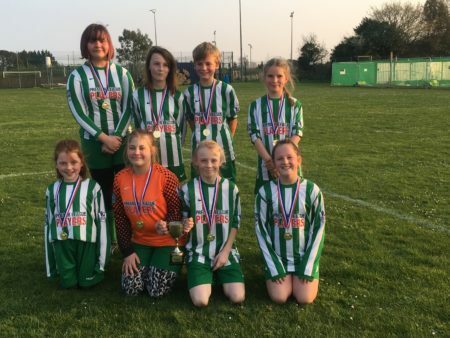 After that Wootton pushed forward for the equaliser but we managed the game well and played out the last minutes for a hard fought win and make Greemount history as the first girls team to win a football trophy!